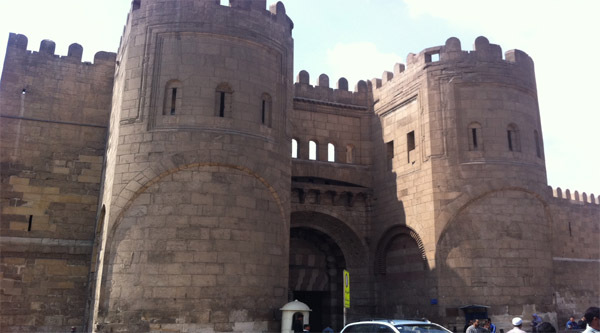 Bab al-Nasr or Gate of Victory is composed of two rectangular towers and is one of the three remaining gates of Fatimid Cairo built by Armenian dictator Badr al-Jamali. This gate is connected to Bab al-Futuh by a wall and the northern wall of al-Hakim mosque is incorporated in this part of fortification. Side view of the gate. 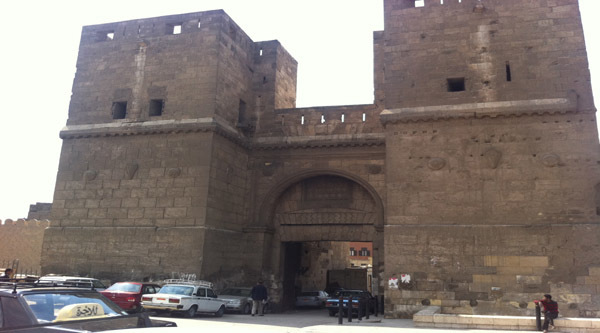 Cairo gate - Bab al-Naser. 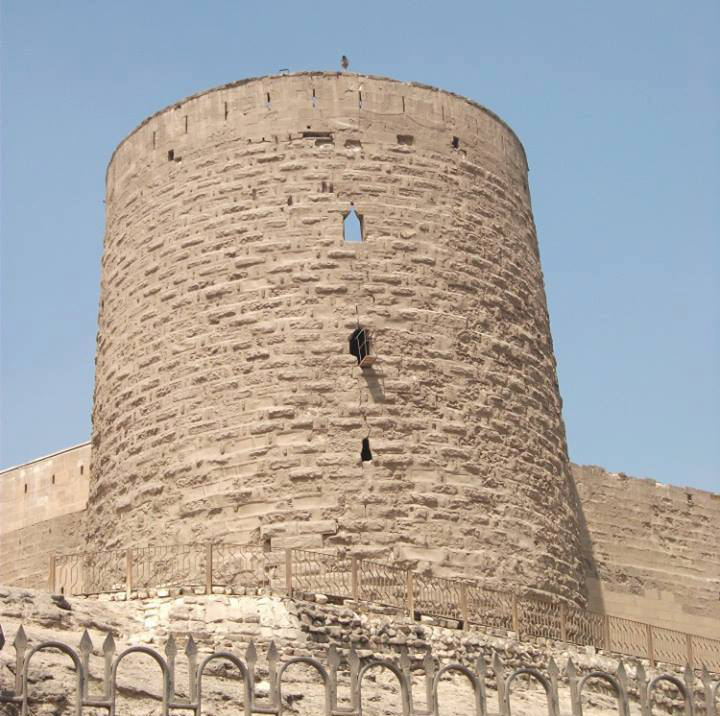 Bab al-Nasr or Gate of Victory (1087-92) is flanked by two sturdy three-tiered rectangular towers divided two-thirds of the way up by a strong horizontal band of corbelled moulding. The first two tiers are built of solid masonry with dressed stone encasing a solid rubble core, and the base is braced with horizontally inserted columns. The upper chambers on the third storey are roofed with domes set on pendentives and the towers were originally crowned with round-headed crenellation. An engraving (1812) in Description de l’Egypte clearly shows the crenellation on the right-hand tower. Today the crenellation is bricked in and most of the arrow slits have been replaced with wider apertures for guns. Creswell attributed these alterations to Napoleon’s troops who occupied the towers between 1798 and 1801. 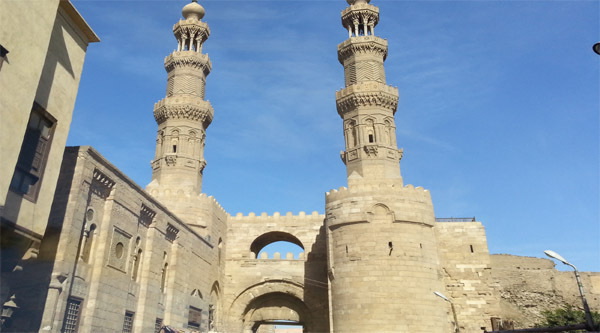 Under a Kufic inscription proclaiming the Shi’ite shahada (profession of faith), the imposing semi-circular entrance leads into a spacious bay flanked by recesses and roofed with a cross-vault crowned with a rosette medallion. 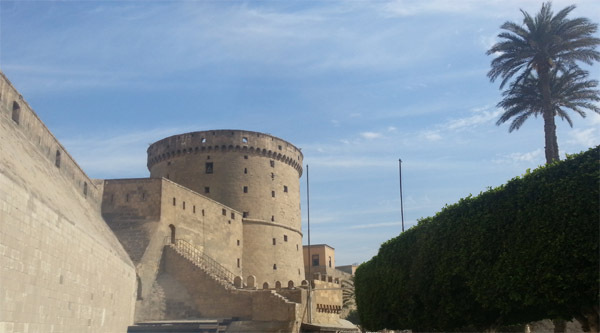 Decorative features on the front of the towers include a band of Kufic under the corbelled moulding and heraldic devices in the form of shields. 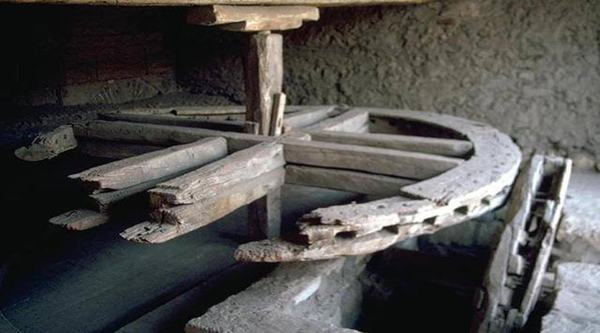 These are both circular and pointed in the Byzantine and Norman fashion, decorated with bosses, moulded rims and serrated edges. According to Behrens-Abouseif they represent the shields of the city and have a protective, talismanic role. Such armorial bearings are unusual in Egypt, although heraldry was used on glass and metalware during the Mamluk period. Heraldic beasts such as lions and dragons are common devices on gates and towers across the Muslim world. In their protective capacity they are the Islamic counterpart to Byzantine icons which were once frequently placed on city gates and fortifications. Interestingly, these fine walls were never challenged by invaders, and by the late medieval period were so encroached upon by other buildings that travellers often reported that Cairo had no fortifications at all. It was not until the 20th century that the walls were cleared and made visible again. 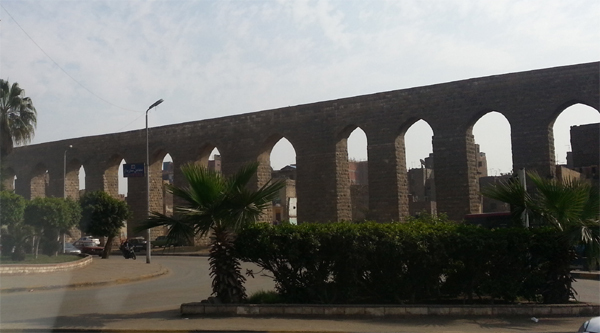 Between Bab al-Nasr and Bab al-Futuh, a handsome Kufic inscription of Quranic texts carved in stone runs along the wall. 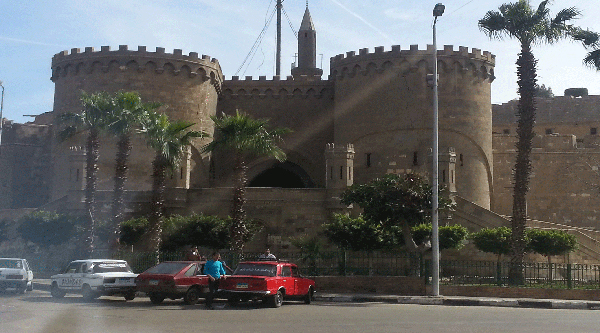 The northern wall of the mosque of al-Hakim is incorporated in this part of the fortification.